I’ve really been enjoying this book over the last month. 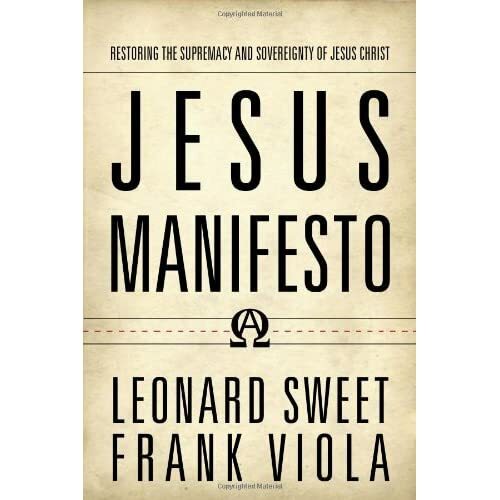 Some terrific theology can be found in this book which takes deliberate steps to restate Christ as the center of our faith. While reading this book, I have been very encouraged and affirmed, as I’m reminded of who I am “In Christ.” I remember being told as I grew up in the church that, because of Christ, God no longer sees my faults and shortcomings when He looks at me. Instead, He see the righteousness of His Son, Jesus.Jesus Manifesto also does a great job of glorifying Jesus as the “Firstborn of all creation.” It reminds us that the whole of Scripture points to Jesus, just as Jesus says to the pharisees in John 5. Jesus, addressing the pharisees in John 5 says these words. Reading Jesus Manifesto has reinforced this lesson; that the purpose for which we study the Word is to know Jesus. Sometimes in my life I have been guilty of looking to the Bible for a quick fix or a “How To.” But the Bible is not a “self help” book, it is in fact quite the opposite, a “deny self” book. As of today, I’m 2/3 of the way through this book, but I have read enough that I would highly recommend it to anyone who is looking to put Jesus back at the center of their world.